I just wanted to take a minute today to post a layout that I made this summer around CHA time. It's been popping up as a top searched post here on my blog, so I thought I'd pass it along for the idea for this month's fast approaching Halloween holiday! 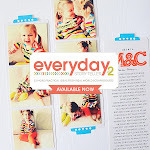 Layering patterned paper over and over in your layout is a great way to incorporate tons of fun - there are 6 patterend papers layered on top of each other in this one - and I've still maintained some of the "whitespace" that I love so much. I also kept things from getting cluttered by setting up a grid, and breaking the elements or photos into groups. Anyway, a little tip for your weekend scrapbooking! We had so much fun carving pumpkins last year! 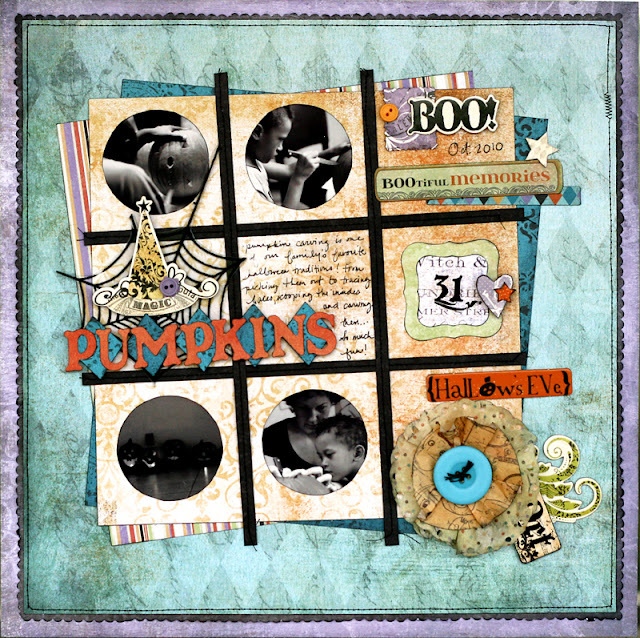 It was loads of fun to use this Halloween line, Oct 31 from Fancy Pants to create this layout! It's definitely a fave! Labels: Fancy Pants Designs, layouts. that grid design is so fun!